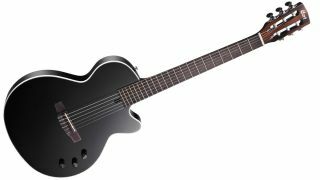 MUSIKMESSE 2016: You might think a steel-strung electro-acoustic is halfway between an electric and a classical guitar, but Cort is here to prove you wrong with the Sunset Nylectric. Featuring a 25.6" scale length, the Nylectric blends classical playability with a thinline, spruce-topped, chambered mahogany single-cutaway body, which makes the guitar more electric player-friendly. The guitar also packs a Fishman Sonicore pickup and VTB preamp, which are controlled via body-mounted volume, treble and bass controls - located in the typical electric knob region, you'll note - while the fusion continues to the bolt-on mahogany neck, rosewood fretboard, 45mm nut width and classical-style tuners. For neoclassical-ites, the Sunset Nylectric could be just the ticket - it's available now in Natural, Black and Translucent Red finishes for $649.99.